Taverna del Capitano is one of Italy’s best restaurants. Located right in front of the mesmerizingly blue waters of the Amalfi Coast, Taverna del Capitano is also one of the most beautiful too. 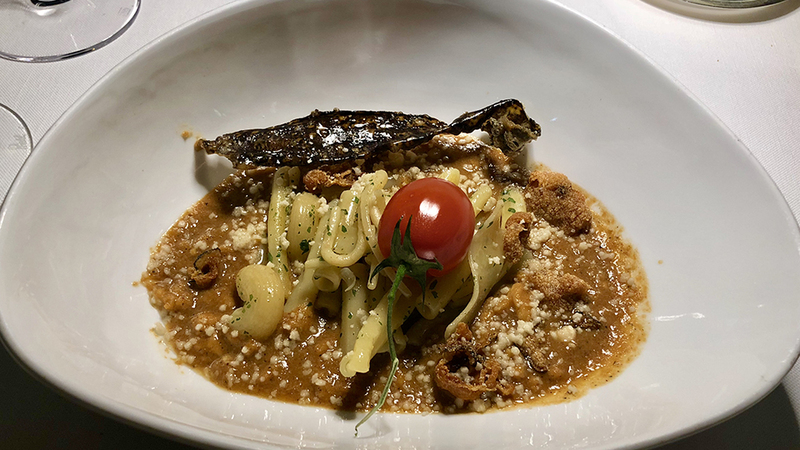 In 2017, the Taverna del Capitano celebrated its fiftieth anniversary, so you realize it has done its job more than well over the years in order to stay in business that long. Be assured that there are worse things in this world than having dinner while gazing at paradisiacally beautiful waters of the Amalfi Coast. Of course, the Taverna del Capitano is also an inn, so you might also choose to stay overnight and wake up with the baby blue waters looking right back at you. In any case, this is the perfect place to get away from it all: after a long but pleasant drive along the winding roads dug into the cliffs overlooking the sea, there is nothing better than unwinding at one of the elegant tables of this refined, spacious dining room. Taverna del Capitano is run by the close-knit family unit of siblings Alfonso Caputo (the chef) and Mariella Caputo (the wine director), plus her husband Claudio Di Mauro, the maître (also a trained sommelier). But it all began a century ago or so when the original Alfonso Caputo (grandfather of the Alfonso Caputo of today) emigrated to Argentina to find fame and fortune. I don’t know about the fame, but fortune he found, and was able to return to Marina del Cantone, where he helped build an electric network grid, a wood-fire oven, and an olive oil mill. Caputo firmly believed in the tourism potential of the beautiful bay and beach of Marina del Cantone, and so bought a building dating back to the 1200’s, and turned it into a bed and breakfast with restaurant. In this manner, he was able to guarantee a job to all of his ten children. However, it was Caputo’s son Salvatore who actually founded the Taverna del Capitano we know today. It was he who started up a new restaurant and inn by restructuring an old fisherman’s home. Having worked as a captain on cruise liners for a number of years, a name for the place wasn’t hard to come by. But Salvatore would never have achieved the success he eventually reached without the help of his wife, Grazia Casa, who loved to cook already when very young. Thanks to her talent, she really made the restaurant’s reputation. 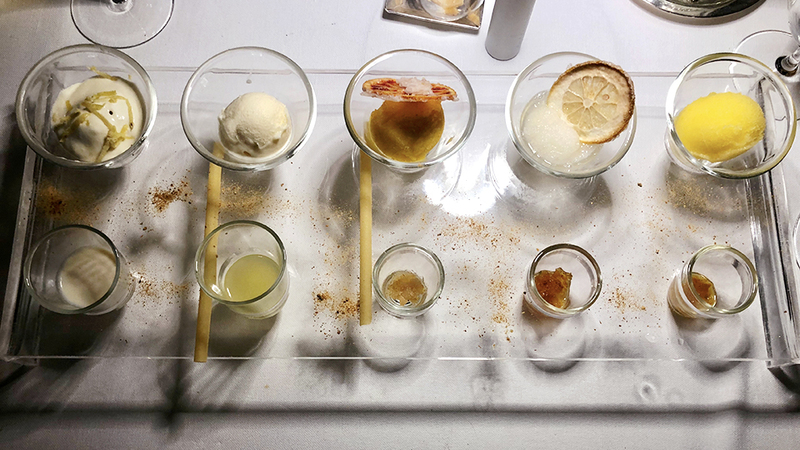 Of course, internships with some of the world’s best chefs didn’t exactly hurt. 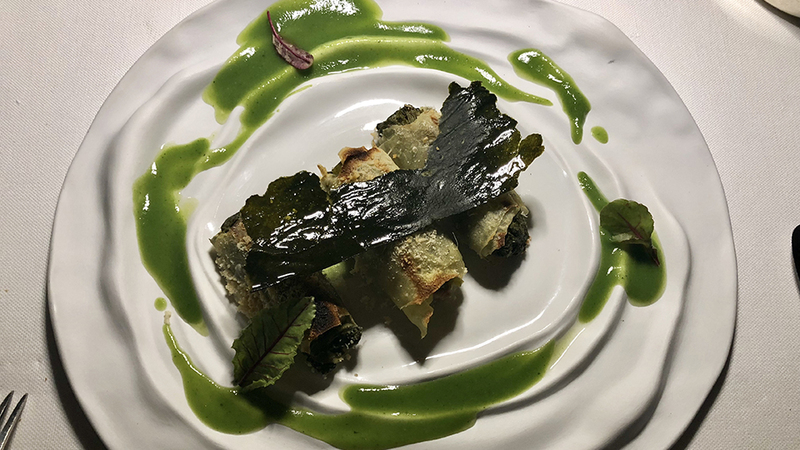 At one moment or another, Casa learned under the guidance of the likes of Gualtiero Marchesi, Angelo Paracucchi, Georges Blanc and Roger Vergé, a veritable “who’s who” of chefs. Her son Alfonso followed in much the same footsteps. In 1999, he worked with Gualtiero Marchesi (the father of Italian nouvelle cuisine or cucina nuova italiana and one of the most famous Italian chefs of all time), and then, in an effort to learn even more, went to work in countries as different as France and Japan before finally returning home to take over the kitchen in the family’s restaurant. Over the years, I have had nothing but great meals at Taverna del Capitano. 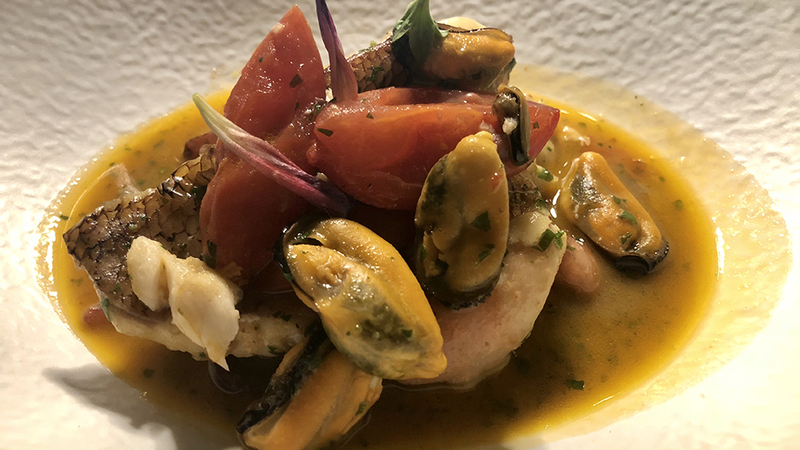 Honestly, I cannot remember one dinner that was less than successful – high praise indeed, because I can say that of very few restaurants where I dine regularly. My latest dinner was exceptional. 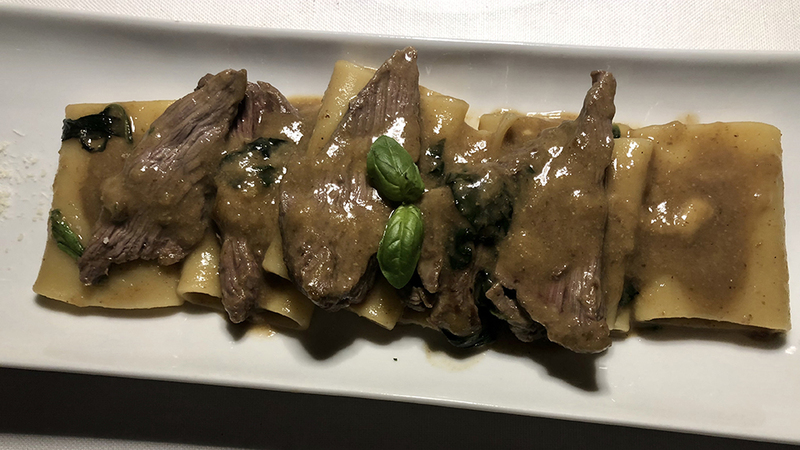 In particular, the totano rosso, the annecchia (in Campania, this term usually refers to a piece of veal, not beef; the cut used can be the eye of round, or eye filet, or rump, depending on whose recipe it is) and the moray eel soup proved absolutely memorable. Interestingly, the bay in front of the hotel is rich in small moray eels (and octopi) that are easy to catch and so there’s always a steady supply of this remarkably tasty fish for the restaurant kitchen. Readers who visit Italy, but also all those who like to eat squid, commonly referred to as calamari, might like to know and understand a little more about this animal (and hence what it is they are actually eating). In fact, calamari and squid are not exactly the same thing. The squid is an invertebrate mollusk or cephalopod, as are the octopus, the cuttlefish, and nautilus. Cephalopods are an important source of nutrients and some of the most widely consumed marine foods, but despite their popularity (or perhaps because of it) confusion is rampant on their subject. First off, squid (Photololigo duvaucelii) and cuttlefish (Sepia aculeata) are not one and the same. For example, 75% of the world’s catch of cephalopods is made of squids, while cuttlefish account for a much smaller portion of the global catch (15%). Furthermore, there is not just one squid and one cuttlefish: in fact, these names refer to large groups of many different species. For example, there are over 300 different species of squids alone, and all of them live in different waters. What this means is that the cephalopod you eat when on vacation in France or Italy is likely to be a different animal than the one you are eating in New York, Rio di Janeiro or Shangai, and that helps partly explain why you might have found yourself wondering over the years why the calamari you eat back home taste different from those you eat when in Europe. One reason is that in the USA, for example, it is the longfin inshore squid (Doryteuthis pealeii, formerly Loligo pealeii), caught in North American waters, that is usually called “calamaro” (it’s one calamaro: calamari is the plural form), but it is a different species of calamaro from the ones you find in Europe. Wait, it gets more interesting. When eating in Italy, you will come across both calamari and totani, and, though, they look similar, they are not the same. It’s easy to tell them apart just by looking at their “tails”. Both have tapering, roughly cylindrical or pen-like bodies with triangular caudal appendages spreading out at the back end that help these animals balance in the water and swim. But these two have very different looking triangle-shapes appendages. Calamari have large wings that gradually spread out, while totani have two small triangular wings that stick out bluntly. In the Mediterranean sea, two species of calamari and two of totani are especially common, and these are the “squids” you are most likely to end up eating in restaurants. The two most common Mediterranean species of the former are the European common squid (Loligo vulgaris) and the veined or long-finned squid (Loligo forbesii). Both these two squids do not live just in the Mediterranean sea: for example, the smaller European common squid also lives in the eastern Atlantic Ocean from the North Sea to the Gulf of Guinea, while the much larger veined squid lives in the Red Sea, the East African coast, and throughout the Atlantic Ocean (and both live off the British and Irish sea coasts). The two most common totani species of the Mediterranean sea also differ in size: the European flying squid (Todarodes sagittatus), though usually small can be quite large (up to 15 kilograms or 35 lbs), while the shortfin squid, also known as the broadtail shortfin squid (Illex coindetii) is much smaller, rarely surpassing 40 centimeters in length. Both calamari and totani look silvery pink in the water, but when caught and placed outside of their natural habitat, calamari look pearly-grey and totani reddish-brown (and hence the name of totano rosso, or “red totano”, commonly used in Italy). I could go on listing differences, but the one readers probably most need to know about (and most likely, care about) is the difference in taste and price: as calamari have more tender meat, and possibly more refined in taste, their price in Italian fish markets (and hence in restaurants) is two to three times that of totani. So, when it comes to cephalopods, much like Barolo, shoes and cars, the lesson is that you always get what you pay for. The food at Taverna del Capitano is great, and the wine list is just as enticing. On this night, I had one of my best restaurant drinking experiences in some time. The 2007 Montesommavesuvio Catalanesca del Monte Somma Català is a lovely wine made from a rare Campanian wine grape that also doubles as a table grape. There is an increasing number of estates starting to make mono-variety wines from it that are all full of early appeal, with simple but bright yellow fruit and herb flavors and generally soft mouthfeels (Catalanesca is a low acid grape variety). Miani’s Ribolla Gialla is one of my two or three favorite Italian white wines, and nothing I drank this time changed my mind. 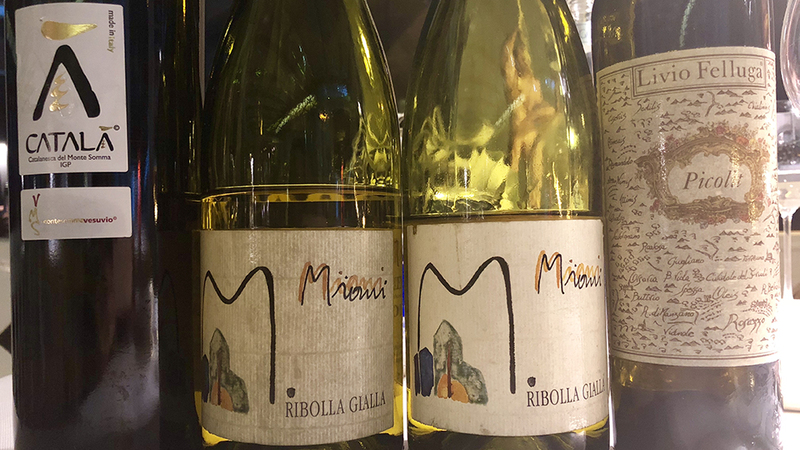 The 2001 Miani Ribolla Gialla is an outstanding classically dry white wine redolent of tangerine, pear, peppery spices and minerals, but the 1999 Miani Ribolla Gialla is quite simply one of the best Italian white wines I have ever tasted. Deep, rich and tactile, with explosively complex aromas and flavors of orchard fruit and spices complicated by marmelady botrytis, the 1999 is superb. Livio Felluga’s 2003 Picolit is a remarkably delicate and well-balanced wine made in an extremely hot vintage. One of my favorite Italian sweet white wines, Felluga’s Picolit is a real benchmark for the variety, with notes of sweet tropical fruit and acacia honey given vibrancy by harmonious acidity. My evening came to a perfect close when I stepped out of the hotel and walked onto the beach, doffed my shoes, rolled up my pants, and took a very long, leisurely stroll in the water before making my way to a bar for a lovely cup of espresso.